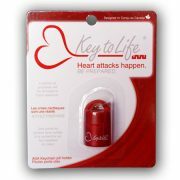 Key to Life secure checkout accommodates orders to CANADA and USA. For INTERNATIONAL orders, please contact us here. To keep shipping costs down in Canada, we offer unpackaged units (Key to Life keychain pill holders without the blister packaging). For American orders, unfortunately shipping costs do not differ between packaged and unpackaged units. Key to Life product in blister packaging. Consider larger orders for a more cost effective shipping rate.